Value Investing Today: Introduction and Chp1: What is Value Investing? Brandes learned value investing techniques from Benjamin Graham in the early 1970's. Today, Brandes has built a respected investment company managing over $50 billion in assets based on Graham's techniques. In this book, Brandes shares insights on his investment philosophy that have allowed him to be a highly successful investor. Brandes starts by defining value investing as finding solid companies with measurable value and buying them when the stock price is significantly lower than their real worth. Brandes quotes Benjamin Graham who distilled down investing into the three words, margin of safety. The margin of safety is the difference between a company's stock price and the value of the underlying business of that company, sometimes referred to as its intrinsic value. He offers a simple example to illustrate what value investing is. Consider going to a department store in the winter time and going to the remote corner where a clearance rack has swimsuits, tank tops and straw hats selling for pennies on the dollar. If you buy from that rack, you are a value investor. Brandes clearly states that value investing does not mean investing in dying industries or buying companies that "makes things that rust". On the contrary, Brandes has invested in companies all over the world in many different sectors including technology and pharmaceuticals. His goal is to find the opportunities with the largest margin of safety. A larger margin of safety provides more protection of capital and better return potential. Brandes does not see growth investing and value investing as incompatible concepts, as long as growth investing is based on fundamental analysis and does not involve speculation. Graham defined speculation as any operation not including a thorough analysis, safety of principal and an adequate return. He extends Graham's definition of speculation to include buying a stock without the intention of holding it for less than 3-5 years and any purchase based on anticipated market movement or forecasting. Brandes does warn that many growth stock prices have already built in lofty future company expectations and don't offer an adequate margin of safety to warrant their purchase. Value investors need to have long term thinking and not be concerned with stock prices, unless they are low enough to warrant a buy. Value investors need to be very patient and very disciplined because people's fear and greed swings stock prices from one extreme to another. Dramatic price volatility can test value investors resolve and for that reason it's best to ignore prices almost entirely. Focus on the underlying business value which does not change all that often, especially when compared to frequently changing stock prices. Every month, media pundits compare the latest same store sales numbers of these two companies, extol the virtues of the one that has outperformed, and simultaneously deride the other. They will look for trends in the month to month same store sales exhibits, and use them to project that one company has done a great job, while the other is suffering from placeholder (examples include high gas prices, worsening consumer credit, charging too low a price, charging too high a price, etc.). But overall, ignoring the minor month-to-month fluctuations that can and will take place in these businesses, which of these companies is the more profitable, and why? In this article we'll attempt to determine the relative strengths and weaknesses of each company to determine whether one business model offers better returns than the other. Clearly, Walmart owns a big advantage when it comes to sales per square foot. But this isn't the end of the story. It could very well be that Walmart charges such low prices, that although they generate a lot of sales, their markups are so low that their profit per square foot is also very low. It's largely accepted on Wall Street that projected earnings are of the utmost importance in basing an investment decision. Companies with the best earnings outlook are usually afforded higher price to earnings (P/E) ratios. With limitations in human information processing, the inherent human psychological biases and the poor performance track record of investment professionals, Dreman asks the pertinent question of whether buying companies shunned by the crowds would produce superior investment results. The companies that the market expects will have the best futures are generally ones with high price to earnings ratios, so Dreman looked at the question of whether low P/E stocks would outperform high P/E stocks. Dreman references studies conducted by Graham and Dodd, Francis Nicholson, Paul Miller Jr., William Breen, Sanjoy Basu and his own research conducted in various time periods between 1937 and 1980 and with American stock data. The data was broken up into different "buckets" (quintiles and/or deciles) of stocks ranging from low P/E to high P/E. All of these studies consistently show that low P/E stocks perform significantly better than the high P/E stocks. Even in periods such as 1970 to 1973 when growth stocks were all the rage in the markets, the lowest P/E decile of stocks had superior returns to the highest P/E decile. Except at the peak of growth stock market mania, the second lowest P/E decile also performs better than the second highest P/E decile. Efficient market theorists would claim that the low P/E stocks have more risk as measured by price volatility and should therefore be expected to have higher returns on average. Their stance is that the extra risk is rewarded with higher returns. However, studies conducted by Dreman and others have shown that the lowest decile of P/E stocks have even less volatility than the highest decile of P/E stocks. "Do you know what's down there? How can any prudent man look at companies like these with such unthinkably poor visibility? The high P/E's, on the other hand, present the best visibility money can buy. They are the real blue bloods of the investment scene. How, then, can one recommend such a reversal of course?" Dreman summarizes the problem as people not wanting to let go of predicting which companies will perform well based on extensive earnings forecasts. Dreman touches back on cognitive biases, where people believe that as P/E ratios move further out from those of average companies that the ratios are increasingly justified. The reverse is true with out of favor stocks. Dreman believes that people are too confident with their evaluations and make systematic errors that lead to the poor results for high P/E stocks and superior results for low P/E stocks. Last week, Francis Chou gave a talk at the Richard Ivey School of Business at the University of Western Ontario. Francis was very generous with his time; as such, prior to the talk, Reyer and I were afforded the opportunity to have lunch with him at The Wave, a restaurant on Western's campus. Francis' long and outstanding investment track record is well known, and described in numerous articles. Yet, similar to what we found when we met with Warren Buffett, there was not a flash of arrogance to be found. Both Francis' mannerisms and his words convey an air of humility that is difficult to find in even the average person. About Buffett, Chou told us one thing in particular that separates Buffett from everybody else is that he's a great communicator. This is one thing Chou believes made Buffett successful before the great returns were realized by most. One sector that Chou believes offers a lot of value right now is in the pharmaceuticals. Although drug pipelines for the larger companies are aging, Chou believes the market is heavily discounting these companies. Their heavy R&D spend should result in at least modest drug discoveries, which he believes current investors are getting for a very cheap price. To avoid choosing a company that ends up with no discoveries, Chou recommends buying a cross-section of companies in this undervalued industry in order to spread out risk. For budding value investors, Chou recommends having a bargainer's mentality. Having grown up in India, he said he had to haggle for everything he purchased, trying to get the best price possible after determining the value of what he was trying to buy. He has translated that mentality to the stock market. To make it, Chou said acquiring knowledge is key. A value investor must be prepared to read 100 - 200 pages daily, to gather ideas, obtain information, and increase one's knowledge. Chou's presentation and Q&A with the MBA class will be uploaded shortly to the Ben Graham Centre for Value Investing. Finally, I would be remiss if I didn't use this occasion to include a shameless plug. In a note sent to us a day after we met him, Chou wrote: "I read some of the articles in your blog. There are some great articles in there. Keep up the good work." In this chapter, Dreman discusses investor biases and relates this to why the performance of investment professionals in general has been so poor. He references studies in psychological research to support his inferences. Researchers have found that people often use mental shortcuts in calculating decisions in order to circumvent processing vasts amounts of inputs. Most mental shortcuts work well in everyday life but they consistently lead to incorrect calculations of investment probabilities. Investors need to be aware of this tendency. Psychologists Amos and Tversky found that researchers tended to systematically overstate the importance of a small sample statistics despite their training in statistical methods. This bias is also present with investors who can be far too confident in their decisions armed with only a small number of supporting facts. The problem with using only a small number of facts is that it may not be representative of the real situation. Another bias for investors is focusing too tightly on current information at the expense of looking at past outcomes for similar situations. Dreman uses the periodically hot IPO market as an example of this phenomenon. He refers to buyers, who in 1968 focused on individual IPO stories and forgot that 98 percent of them had dropped in price after the market break in 1962. Once again, in 1981, investors were frenzied to buy hot IPO issues and seemingly forgot the experiences that investors had with IPO's in 1968. Dreman's advice is to take into account the prior probabilities before making investment decisions. Dreman discussed the concept of "regression to the mean" and how market participants seem to ignore this concept. In 1927 and 1928, investors thought (by their investment choices) that 35-40% returns were going to continue, despite the fact that those returns were sharply different from the long term market average. He comments that the belief that extreme returns will continue (either positive or negative) continues to exist in the market, despite the fact that this is out of line with what history has shown to be true. His advice is for investors to consider the longer term characteristics of stocks when current stock returns are abnormally high or low. Another bias is believing that if a stock price is rising the stock is good and if the stock price is falling than the stock is bad. This bias comes from our intuitive belief that consistent inputs allows greater predictability. Dreman references Graham and Dodd who wrote "an inevitable rule of the market is that the prevalent theory of common stock valuations has developed in rather close conjunction with the change in the level of prices". Dreman's advice is not to expect immediate success with your investment strategy. If you expect immediate success, you are likely to get caught up trying to invest in "current fashionable" investments and fads. In my last post on Hart Stores (TSE: HIS) here, we looked at some value measures that indicated their stock might be trading cheap. However, after pouring over the historic financial statements, it's clear that there have been serious signs of trouble brewing at the company. First, the operating margins are less than half of what they were in 2004. In 2004, the operating margins were 7.5% and are now around 3.2%. There are other indications of trouble including year over year sales dropping by 2.9% and same store sales decreasing by 4.2% in the same period. Net earnings, return on shareholders' equity and return on net assets have all been falling this past year. As value investors, we like to buy good companies at low points in the business cycle, provided that business conditions return to normal during a better performing economy. Some of the problems I see with Hart stores started when the Canadian economy was hot. Operating margins started contracting in 2004 which is not something I would expect for a Canadian retailer. In their annual report, Hart Stores refers to increased competition from large retailers with superior buying power, and I think it is likely that this competition has put pressure on Hart Stores operating margins. Hart Stores operate their retailing stores in Central, Eastern and Atlantic Canada and have strategically tried to differentiate themselves from other retailers through creating a more customer-friendly shopping experience and stronger customer service than the competition. Will this differentiation strategy be enough to entice consumers to continue shopping at Hart Stores as other big box retailers offer similar products at cheaper prices? I think this scenario becomes less likely as economic conditions weaken. For the time being, I would be cautious in seeing Hart Stores as a value play until it's evident that their current problems are cyclical in nature and not indicative of more sinister secular problems. In the first chapter, Graham makes an important distinction between investors and speculators. Simply put, investors are those that put their money in investments. Investments are that which “upon thorough analysis promises safety of principal and an adequate return.” Everything else is speculative. Graham repeatedly points to the sloppy language many people use in referring to themselves and others as investors, when in fact they are speculators. This is more than mere semantics. Investors need not fear devastating and irreversible losses. This is because investors, by Graham’s definition, have put their money in investments which promise safety of principal. This is not to say that investors will never lose money, but it is true that investors will not suffer the same devastating losses as others, because they have protected their downside potential. For example, investors were not devastated by the losses associated with the dot com meltdown. Speculators were. Investors did not allow these companies to become the bulk of their portfolios because it was clear that the underlying value of the tech companies did not justify the excessive stock prices the market was assigning them. This is not to say that speculation should be avoided at all cost. Instead, it must be kept to small portion of your portfolio (Graham suggests no more than 10%). Speculation does have virtues in that is necessary to promote entrepreneurship, as it allows untested new companies to raise capital for expansion. aspire to adequate, not extraordinary, performance. Extraordinary performance should not be the goal of the intelligent investor, as such performance often leads to unwarranted risks that compromise the investor’s return. Note that none of these suggestions relate to the market price or what is “hot” in the market. Instead, Graham says the intelligent investor looks only at the underlying business. Of course, the valuation that the intelligent investor puts on the business must ultimately be compared to the market price, but this is not to suggest that the market price or pricing direction should be the sole characteristic of purchase. For an investor to have a reasonable chance for continued adequate returns, he must follow policies that are (1) sound and promising, and (2) often not popular on Wall Street. This takes courage, determination and patience, but the intelligent investor can rest easy knowing that, in the long run, he is more likely to be better off. Two days ago, we considered the huge gap in inventory valuations at A.M. Castle (NYSE: CAS). On the one hand, a LIFO valuation tells us the inventory is worth $248 million. But the replacement cost of the exact same inventory is listed at $423 million. Thinking as a value investor, if you were to buy this company (or a piece thereof), which (if either) of these valuations would you rely on? Since the company's market cap is just $470 million, it's an important question! What we want to know is the market value of that inventory. The key to answering this question lies in determining how much someone (i.e. a customer) is willing to buy the inventory for. Just because the inventory has a high replacement cost ($423 million) does not mean anyone will actually buy these goods for that much! On the other hand, the LIFO amount ($248 million) is the one that is stated on the balance sheet. This amount has to be written down to the lower of cost or market (as per Note 8 to the quarterly financial statements), so at least we know the inventory is not worth less than that (according to management). But how much more than that are its customers willing to pay? Consider taking a look at the company's gross margins. Here we get a hint of how much above the company's cost of the goods that customers are willing to pay. Last quarter, sales were approximately 30% higher than COGS. As an approximation, we may be able to surmise that the inventory carried at $248 million can be sold for about 30% higher than this number, bringing the market value estimate of inventory to about $322 million. Of course, this method is not perfect. Can you see any potential problems that we can rectify? Would you expect the actual market value of inventory to be higher or lower than the $322 million estimate we just calculated? Clearly, Staples has consistently outperformed as it has generated more income for each dollar it has invested. However, the disparity between the price/book values for these companies results in returns to current shareholders that are the exact opposite as those depicted above! With a Price/Book value of about .5, investors in Office Depot are buying the equity depicted above at about half price! On the other hand, with a Price to Book for Staples of almost 3, investors are paying a huge premium for those returns! Despite buying a mediocre company, you could get great returns relative to your investment thanks to the discount to book value at which it trades! Of course, this doesn't necessarily mean Office Depot is a buy relatively to Staples. First of all, we're only looking at the past. If you believe that Office Depot's margins or returns will get worse from here relative to Staples' (and they already have since year-end 2007), then its returns will be worse than depicted here. 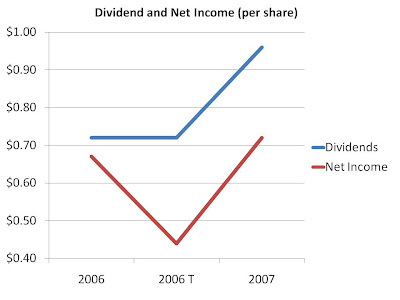 Furthermore, if Office Depot management insists on expanding, despite the mediocre returns it receives for each dollar invested, then you risk losing the returns on market value (depicted immediately above) as that capital will be deployed and thus return a rate closer to the ROE depicted in the first graph. Finally, ROE can be inflated by using debt. Therefore, you'll want to make sure a company you invest in can safely cover its debt obligations. Analysing stocks with fundamental analysis requires configural (interactive) processing, where the impact of one piece of information on other inputs needs to be considered and weighed for impact. For example, a companies competitive environment may affect how an analyst views the impact of growth rates. The successful investor needs to process an exponential number of diverse interactive factors which taken together affect the overall valuation. Dreman references clinical psychological tests that convincingly demonstrate that humans are not efficient processors of interactive inputs. Rather, humans are very competent and reliable in processing information linearly and with a defined sequence of steps. Dreman collected 52 samples of expert forecasts of favorite stocks and industries from 1929 to 1980 and found that 77% of the professional surveys underperformed the market. The implication is that you would be better off by randomly selecting stocks than following professional advice. Dreman references many more examples that support the idea of systematic forces working against investment professionals. In the next few chapters Dreman will examine these systematic forces and how to counter them. Dreman foreshadows a more effective approach to security analysis by quoting Garfield Drew from an earlier era (1941) "In fact, simplicity or singleness of approach is a greatly underestimated factor of market success. As soon as the attempt is made to watch a multiplicity of factors even though each has some element to justify it, one is only too likely to become lost in a maze of contradictory implications ..."
Clearly, WWE has been paying out more than it has been earning! Over the last three fiscal years ("2006 T" representing an 8-month transition year to a new fiscal year-end), WWE has paid out 57 cents more per share than it has earned! How does it do it? Balance Sheet strength! The company has virtually no debt, and more than $2.50 of cash (including short-term investments) per share. That means it could continue to pay out cash over and above its net income by 25 cents per share the next 10 years! Does that make it a buy? Not quite. At a share price of $17, even if they immediately paid out that entire $2.50 to shareholders, you would still be paying $14.50 for a company that earned 72 cents / share last year, representing a P/E of 20. When a dividend yield looks appealing, make sure it's not too good to be true! I recently started reading Benjamin Graham’s The Intelligent Investor. For those of you who may not have heard of Benjamin Graham, he was a professor at Columbia Business School where he created an approach to investing known as Value Investing, which he first laid out in The Intelligent Investor in 1949. He and David Dodd revised the book several times over the subsequent years before Graham’s death in 1976. Benjamin Graham taught many of the greatest investors of all time. Among Graham’s students are Warren Buffett, William J. Ruane, Irving Kahn, Walter J. Schloss, and Charles Brandes. Jason Zweig, a senior writer for Money, Time and CNN, edited and updated the book in 2003 to show Graham’s methodology as applied to events since his death. I will discuss each chapter as I progress through the book, to give you an idea of the key lessons and maybe turn you on to Value Investing. How’s that for a reference? When the greatest investor of all time says your book has been the best investment book ever written, you know you’re on to something good! A stock is not just a ticker symbol. It is an ownership interest in a business with an underlying value that does not depend on its share price. The market always swings between unsustainable optimism (making stocks too expensive) and unjustified pessimism (which makes them too cheap). The intelligent investor is a realist who sells to optimists and buys from pessimists. The future value of every investment is a function of present price. The higher you pay, the lower your return will be. No matter how careful you are, no investor can eliminate the risk of being wrong. You must build in a margin of safety - never overpay. The secret to financial success is inside yourself. Be a critical thinker with patient confidence. Develop discipline and courage. I reproduce in part these core principles as they govern the remainder of the book, and the basis of value investing. According to Graham, the success of an investor is based as much on his attitude as it is on the investments. how to have the right attitude and behaviour for achieving your potential. The introduction is straightforward and helps set the tone for the remainder of the book. Graham uses present-day (at the time he was writing) trends to illustrate the core principles and proper behaviour for an intelligent investor. Jason Zweig points to the failure of many investors and analysts (including Mad Money’s Jim Cramer) to follow these principles in the lead-up to the dot com bubble. These investors failed to recognize that the tech stocks were not based on real underlying value and instead were being pushed ever higher by irrational optimism. Once the market corrected to represent that real underlying value (or lack thereof), a great deal of wealth was destroyed. Warren Buffett and other Graham disciples never got involved in the tech bubble and escaped largely unscathed. 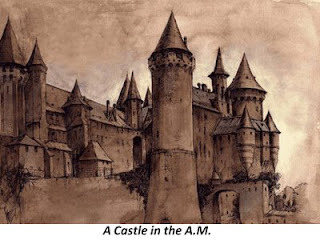 A.M. Castle (NYSE: CAS) is a metals and plastics distribution company out of Illinois. As of its latest quarterly report, it had inventory of $248 million. The inventory is also stated to have a replacement cost of $423 million. So how can it be that the company has two seemingly different levels of inventory, $174 million apart? The actual goods in inventory are considered the same in both cases, but what's different is the way the value of that inventory is calculated. As we've discussed here, book value is not a perfect measure of a company's true worth (in fact, sometimes it's not even close). However, in this case, the inventory difference of $174 million is so large that it makes a rather large difference in whether this company is undervalued or not, as Castle has a market value of just $470 million. Hart Stores Inc. (TSE:HIS) is a department store retailer operating 80 stores in primarily Eastern Canada. This is a family run business with the Hart family controlling 56.7% of the outstanding common shares. This company caught my attention for several reasons. First, the price to book value on the stock is around 0.60. Secondly, the price to earnings is only 7.7 times. Thirdly, the company is earning a pretty decent return on its invested capital calculated to be approximately 10%. The company is a small cap stock with a market capitalization of $28.56M. As we mentioned here, small cap stocks often are not as heavily followed as large cap stocks and for this reason can be priced inefficiently in the market. The company has positive operating margins that were fairly stable from 2002 to 2006, but over the past 2 years, operating margins have declined. Total sales are also down this past year over year from $166.4M to $161.6M. During the last 2 years, the company's stock has substantially declined in price from $4.72 on Aug 25, 2006 to $2.10 on Aug 25, 2008. It's possible the market may have been overly pessimistic towards the stock. At this point, the company looks interesting and I will discuss it further in my next post. In this chapter, Dreman references academic research that supports the idea that individuals gravitate towards crowd thinking under stressful or uncertain situations. When uncertainty is present, people also tend to abandon objective reasoning and look towards authoritative and so called expert opinions. The stock market is shrouded in uncertainty and for this reason people often look to expert opinions. Dreman has already demonstrated in previous chapters the dismal track record of many so-called market experts. Crowd thinking is dominated by images. The image must be simple and compelling such as the frequently courted image of "instant wealth". These images can swiftly change. Dreman explains several of the market bubbles that have occurred in history. It's fascinating to observe that people make the same mistakes over and over again particularly with the stock market. This demonstrates the prevalence and power of group thinking in the market. A student of market history, Dreman observers that all manias have surprisingly similar characteristics. Each mania has sound beginnings but is based on a simple idea. The demonstration of quick riches demonstrated by early participants in a bubble leads to more feverish buying and initially a self-fulfilling prophecy as more participants buy into the image of instant wealth. Crowd thinking blinds most people to the dangers of the bubble. The opinions converge as a consensus opinion is formed and facts are ignored. Then at some point, the image changes and anxiety replaces the enthusiasm and overconfidence in the market bubble. At that point, panic breaks out and the bubble breaks. Lastly, we as investors (in general) do not learn from these past mistakes because each market bubble is believed to be different than the last one. 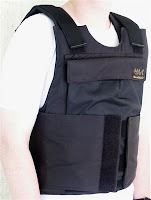 A reader recently brought our attention to Protective Products of America (TSE: PPA), a micro-cap that provides ballistic protection to military and law-enforcement. On the surface, this appears to be a company that could offer some value. However, too many red flags pop-up upon further review. By themselves, each of the items discussed below don't necessarily disqualify an investment, but PPA has so many of these issues that its just not worth the risk (as we prefer to buy companies that look like sure things: examples here). First of all, its debt to equity ratio of about 55% seems a little bit higher than what we're usually comfortable with for this type of company. But throw in the fact that most of the equity is made up of Goodwill, part of which was just written down last quarter, and you quickly realize that this company is funded mostly by debt. And much of this debt has been called, thanks to the company's poor performance in the last year. As such, the company must refinance, either by issuing shares or replacement debt, at terms which are not likely to be favourable to shareholders. So how did management get into this mess? They overpaid for an acquisition, resulting in a write down last quarter of about 1/3 of shareholder's equity! Perhaps the economic climate blindsided management, so maybe they deserve a free pass on this one? Unfortunately, this doesn't even scratch the surface in terms of signs of weak management. The company has had issues with revenue recognition (they were recognizing revenue before they had officially made a sale, thus moving earnings forward, making earnings appear higher than they were), and were forced to restate results by independent auditors. Even if the statements are correct now, it's not a good sign that management is not being conservative with its accounting. Finally, there are a slew of transactions the company has undertaken whereby corporate officers have personally benefited! 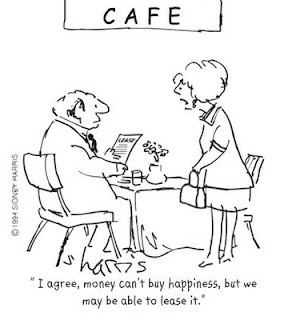 For example, the company has leased property that is owned by an executive! Such conflicts of interest result in shareholder interests not being aligned with those of management. After all, this manager might be tempted to increase company investment at the property which he owns, whether it benefits shareholders or not! That's not to say that management is dishonest. Nevertheless, as discussed in Security Analysis, such a situation is detrimental to shareholders, through no fault of management. Although many of these factors are qualitative, they paint a picture that suggest an investment in this company is not protected on the downside. For all I know, management is perfectly honest. Unfortunately, the circumstantial evidence is enough to prevent a "swing" at this company. In the latter half of this the final chapter, the authors discuss the second type of market analysis as defined earlier. This type of market analysis involves using factors outside of the stock market (e.g. interest rates, steel production) in order to attempt to predict the movement of prices. The authors discuss various methodologies that have been used as predictors, including one that suggested security prices had reached a bottom when aggregate blast furnace use ran at 60% of capacity, and another that theorized that bond prices reached a high 14 months after a low point in pig-iron production. Some of the methods employed derive their adoption due to the fact that they are vaguely plausible (for example, it is an agreeable thing to say that a rise in interest rates will lead to a sharp decline in stock prices), and they rely on the fact that they have worked in the past. On this final point, the authors argue that once again this form of market analysis suffers from the same drawbacks as those of chart reading (the past does not necessarily equal the future). Though security analysis is also an art, as the analyst must often rely on his knowledge and ability, security analysis has the advantage over market analysis. In market analysis, there are no margins of safety. The price either goes up, or it goes down. In security analysis, the investor can protect himself such that even if the results are negative, the purchase might still prove satisfactory. Furthermore, the market analyst requires constant buying and selling. Therefore, transactional costs have a taxing effect on overall results. A third disadvantage is that success in market analysis requires one to win a battle against others who are also employing market analysis. The security analyst, on the other hand, is not usually buying and selling from someone who has carried out a similar analysis. Therefore, the market analyst is counting on being more clever than his competitors. Finally, the authors discuss the prevailing opinion on Wall Street that a favourable short-term outlook for a company should result in positive stock movements. However, this line of reasoning does not take into consideration that such outlook is already baked into the stock price. Should an analyst prove particularly successful as compared to others in determining the outlook, he is still making the assumption the current stock price is reflective of its intrinsic value. Thus ends the final chapter of Security Analysis. An appendix of approximately 80 pages follows which describes various examples to help illuminate points that have been made throughout the book. It was awesome to have the opportunity to listen to the wisdom of Francis Chou, who manages over $1 billion, in person at the Richard Ivey School of business via George Athanassakos’ value investing class. I learned many things during the course of the discussion and will share a few of the ideas here. With regards to learning how to be better investors, Mr. Chou informed us that reading the autobiographies of great value investors and watching the actions of the best value investors is a great way to learn. He singled out an autobiography by Bernard Baruch as an example of an autobiography that he has read. An interesting anecdote for value investors is that Benjamin Graham caught the eye of Bernard Baruch in the 1920’s who tried but failed to bring the younger Graham on as his junior partner. Mr. Chou doesn’t take a top down approach to stock analysis. From what I gathered, he is a microfundamentalist who looks for value opportunities all over the globe. Importantly, Mr. Chou does not take just one view on valuing a security but rather looks at an investment opportunity from several different perspectives. He told us that you can feel more certain about purchasing a company when all of the different views are consistently indicating value. As an example, his reply to the question of whether the housing market was undervalued in the US was that some housing value indicators seem cheap but if you look at the pricing from a historical rental to home price perspective, the housing market is not overly cheap. Mr. Chou cautiously indicated that doubling down positions with investments is okay, but only if you are very certain of the company and the situation. He mentioned that value investors often buy in early and therefore feel like they should buy more if the stock has fallen below their entry price. He acknowledged that with excellent knowledge of the situation you could concentrate your holdings more on a few stocks in the same way the Buffet does, but suggests that you had better know the company as well as Buffet would before doing so. Tellingly, he left us with the advice that the first step to getting out of a hole is to stop digging. In closing, I found Mr. Chou to be a rarity in the investment world. He is a very well read and successful value investor, but still very humble and generous. In my opinion, Mr. Chou is a refreshing role model for investors in an industry commonly motivated by greed and selfishness. The fundamental analyst takes into account all available information that could affect a company’s stock price, synthesizes the information and determines the intrinsic value of the company. In 1930, John Burr Williams defined intrinsic value to represent what a shareholder could expect to get from a stock over time. The fundamentalist believes that market forces can move stock prices away from its intrinsic value but that eventually stocks will return to their inherent values. The main body of work that supports fundamentalist theory is the “Security Analysis” text written by Graham and Dodd in 1934 (summarized here). This text is considered the defining work for fundamental theory and it underpins the fundamental analysis occurring on Wall Street. Dreman brings up the important question of why the vast majority of professional investment institutions continue to fail to beat the market even when using fundamental analysis. There are a few reasons given by Dreman as to why fundamental analysis may not be providing superior returns than the market. First, one branch of fundamental analysis called growth school has dominated all fundamental analysis for some time. Some of the problems with valuing growth stocks include difficulty in accurately predicting future growth trends, failure to properly identify true durable growth stocks and the changing market sentiment of the appropriate price to earnings multiple to use in pricing a growth stock. Many practitioners of Graham and Dodd's methods fail to achieve good investment results because of a systematic failure to apply all of Graham’s methods. Graham claims that his approach has been downgraded in favor of placing more emphasis on near term sales and earnings predictions for a company instead of looking at price to earnings ratios, book value, dividends and the financial strength of a company. Dreman conjectures this might be why Graham once said “he might be the most read and most forgotten man on Wall Street”. Too many investment decisions are made with a blind bias towards choosing the company with the most market share. But profitability is what investors should be looking for, not market share. In this article by Todd Sullivan, he suggests that to avoid losing market share, Home Depot desperately needs to invest all its savings into remodeling old stores to get the stores on par with Lowe's. It's quite possible that this would increase profitability, but the argument is unconvincing, as it relies on no profitability data whatsoever. In this article, we examine the data between these two companies in order to determine the relative strengths and weaknesses of these two home improvement retailers, in order to give us hints into what each company could be doing better. Indeed, we do see (from the gross margin percentage) that Lowe's is able to mark-up its products more than is Home Depot, somewhat making up for the lower sales numbers. 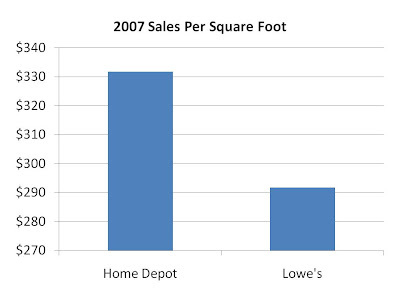 Nevertheless, we still see (above) that Home Depot makes a larger gross profit per square foot, after taking into account their higher sales per square foot. But we're not done here. If Home Depot advertises more than Lowe's, or spends more on training or giving their stores visual appeal, they may still prove to be less profitable, so let's take a look at general, administrative and depreciation expenses as a percentage of sales: last fiscal year, these expenses represented 24.2% of sales for Home Depot, and 24.9% for Lowe's. The result, all said, is that Home Depot actually makes a few bucks more per square foot than does Lowe's. Now, this was just an initial glance at the two companies, and is far from perfect. Being the larger company, Home Depot should benefit from economies of scale, but as Lowe's catches up in size, we may see their margins improve. Also, being the older company, Home Depot may be benefiting from having better locations, which will cost them on lease renewals in the future or tie up capital for owned locations. Furthermore, we haven't even begun to consider the capitalization structures of these companies in order to determine whether shareholders are getting the best bang for their buck. However, at least it's a start. This is far better than jumping to conclusions on anecdotal data that Home Depot must spruce up all its stores, improve its lighting, better train and better pay its employees. Home Depot's plan of closing its least profitable stores, slowing down new store openings, and refurbishing certain stores could result in better profitability without the huge overhaul that many are calling for. We'll find out soon enough! In this the final chapter, the authors discuss whether forecasting prices (termed "market analysis") is a useful alternative or supplement to security analysis. Although the two are often used in concert by Wall Street firms, Graham and Dodd believe there is nothing to gain from market analysis. Market analysis is divided into two groups. In the first group, market movements are predicted solely from past market data (termed "chart reading"). In the second group, a variety of economic factors are considered ranging from interest rates to political outlooks. Chart reading cannot be a science, as its conclusions are not dependable. If they were dependable, everybody could make accurate predictions. This is impossible because these actions would result in a loss of the method's effectiveness. Effectiveness for a given chart reading methodology is thus necessarily dependent on keeping the knowledge secret. As such, the authors argue, there is no method which has been continually successful for a long period of time, for if there were, it would be adopted by masses of traders, bringing its usefulness to an end. The theory of chart reading also has logical fallacies. Just because the market behaved in a certain way in the past, it does not follow that this serves as an accurate predictor of the future. In security analysis, the same may hold true for past earnings, which are used to help predict future earnings. Though these predictions again are not perfect, the security analyst has the ability to protect himself with a margin of safety, while the market analyst does not. Chart readers tend to encourage people to immediately cut losses short when they should occur while riding profits for as long as possible. Though this prevents large losses and allows for large gains, mathematically there is no benefit to such policy, as the aggregate of small losses exceeds the few large profits. 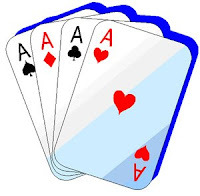 With transaction fees serving as the "house advantage" to use a gambling analogy, traders are sure to lose over the long term. As mentioned here, Amisco is a Canadian furniture manufacturer that has been ravaged by coinciding forces of cheap Asian imports, a rising Canadian dollar and a weakening US consumer. As observed, the price to book value of the stock is priced cheap at 0.38 times. This means you can buy the company's shareholder interests for 38 cents on the dollar. However, you may not want to own these assets even at a discount to their book values, so it's worth looking at what one could expect to receive under a potential liquidation scenario. If the market has priced the stock well below its liquidation value, this could be a bargain purchase, despite the fact the entire industry is suffering. Obviously cash is liquid, so it gets valued at 100%. Accounts receivable should be largely collectible so no major discount is required. The temporary investments are mutual funds which were valued as of May 31, 2008. Its possible the mutual fund prices have slid a bit, so I will discount them to 80% of the balance sheet value. A discount value of 60% to inventory is applied since it is largely comprised of finished goods and work in progress. Under a liquidation scenario this inventory might get marked down significantly in order to sell. Capital assets are much more difficult to value without intimate knowledge of the company and the industry. To deal with this, one can use conservative valuations for the assets to protect against placing too high a value on them. Besides the land and buildings, most of the assets are believed to be specialized for the manufacturing furniture business. It is doubtful that an abundance of new entrants are coming into the Canadian furniture industry and existing entrants may already have manufacturing overcapacity due to shrinking sales. For these reasons, I wouldn't expect to recoup much of the equipment and machinery costs. To be conservative I severely marked these assets down. Operating leases can be thought of as debt since they are payments bound by a contract. Since Amisco is leasing commercial rental property, a lot of these costs could likely be transferable to another interested party. For this reason, I only considered 25% of the present value lease payment as applicable to Amisco as a liability. The results of the liquidation value are tabulated below. Since the current stock price is $1.64 per share and the calculated liquidation value is $3.30 per share, the market is offering the stock at a 50% discount to its current liquidation value! Even though we calculated a liquidation value for the stock, the company does not seem to be in immediate danger of insolvency. The company has no balance sheet debt and has a current ratio of 3.7 to 1. The company is still earning a small profit and are continuing to execute on the strategy of exploiting weaknesses of cheaper foreign manufacturers by improving on quick delivery times and offering customized furniture options. To quote the superb value investor Francis Chou, "Good things can happen when you buy stocks at bargain prices". I'll leave it to the reader to decide if Amisco is priced as a bargain. For the first time, George is offering a fall seminar to be held sometime between October and November in Toronto, Canada. The seminar is geared towards Portfolio Managers, Finance Professionals, Finance Executives and Individual Investors with an understanding of basic accounting. The class sizes are deliberately held small so that each individual gets ample opportunity to ask questions and get the most out of the experience. If you are interested in reserving a seat please contact us. In this chapter, the authors discuss price discrepancies among senior issues selling at speculative levels, and across various types of securities, demonstrating that the market can be woefully inaccurate in its valuations. Seasoned issues, defined as senior securities of companies the public has known for a long period of time, have a certain price inertia to them. Many buyers of these issues simply bought by reputation, rather than sound financial analysis. Therefore, despite degradation in the statistical exhibit of the bonds, these investors do not sell them readily, resulting in high valuations. On the other hand, any adverse development will result in a severe decline for unseasoned issues, defined as senior securities of companies which are relatively new. Therefore, the authors advise against participating in the purchase of new senior issues for companies with relatively short statistical exhibits. Although this may suggest that unseasoned issues may be purchased after an overreaction to an adverse development, the authors caution against this modus operandi. Usually, such companies have not been around long enough to prove they can weather economic downturns, and furthermore, the authors point to their research disclosed in an earlier chapter that companies of dominant size are best able to maintain strong financial status through such downturns. The authors also demonstrate comparisons of senior issues, offering advice on when one security should be exchanged for another. Care is advised in such situations, and investors are warned not to exchange simply due to a slightly higher performing statistical exhibit of past results. The only time a switch between senior securities should occur is when the issue to be purchased is attractive absolutely (not just relatively), or if there is a definite relationship between the securities being exchanged. This latter group can include switches across categories of securities, e.g. a cumulative preferred with a large dividend backlog trading below the common of the same company. Finally, the authors note some rather striking price disparities that occur due to supply and demand factors of market players which result in hedging opportunities. Amisco (TSE: IAC) founded in 1954, is a company with expertise in manufacturing and delivering personalized furniture in Canada and the United States. They target smaller retailers whose customers prefer personalized furniture. The company specializes in composite painted tubular and steel sheet residential furniture and offer a wide selection of furniture products available in many different finishes making thousands of possible product combinations. Amisco's stock price is at $1.64, which is down 84% from the $10.15 price in April 2004. The P/B on Amisco's stock is currently 0.38 and that is the part that I find particularly interesting. In recent years, sales have been in a down turn and the company has not been paying a dividend. It is entirely possible that this is a secular issue for Canadian manufacturing. On the other hand, even if it is a secular issue, with such a low P/B, the market might have been overly pessimistic in pricing the stock, and value may be found. Amisco's relatively low stock price is not surprising, as there has been a slew of factors working against Canadian furniture manufacturers in recent years. Factors such as a flood of cheaper product imports from Asia, the rising Canadian currency (making product exports more expensive from Canada into the US) and a weakening US consumer have aligned to really hurt the Canadian manufacturers. However, Amisco is attempting to fight back. They are striving to further decrease product delivery times and to improve operational efficiencies with the introduction of factory automation equipment. So far, the company is still enduring significant sales declines but have still managed to squeak out an earnings profit. 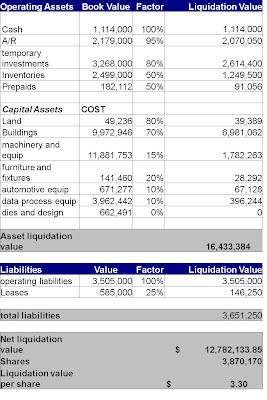 In my next post, I will dig deeper into the balance sheet and estimate a liquidation value for the company's stock, as a baseline value for the company's stock. I showed here that Craftmade International Inc. seemed interesting to value further according to some preliminary screening tests. If a company looks undervalued, the next step could be to value the earnings power and assets of the company. Valuing these components properly requires a deeper look at the business, the industry and the management to better understand and reflect the risks of the business. There are a few things about Craftmade which make investing in the stock fairly risky. First, the company is heavily reliant on sales from Lowe's. Second, Craftmade does not have long term contracts with their customers and on Nov. 2006, Lowe's cancelled 14 of the lighting SKUs previously supplied by Craftmade. This had material impact to the company's overall sales. Lowe's had decided to start sourcing these products directly from overseas manufacturers. Third, the company has a new CEO and CFO as of June and Aug of this year, but the reasons for the change are not clear (imho). Additionally, the suspension the dividend, as was announced in May of this year, could be an indication that additional problems are brewing. Companies like Craftmade depend heavily on being able to come up with new product designs, get overseas manufacturers to make the products and then market them to their customers (largely big box retailers). The problem is that the industry is increasingly moving towards big box retailers going direct to manufacturers and squeezing out the "middle-man" companies like Craftmade. With this business model, Craftmade can survive as long as they continually add value to the relationship with their customers by introducing new, innovative designs and products that are one-step ahead of the competition and are well received by the end consumers. I believe there are a lot of things that could go wrong with Craftmade's existing business model. One way to value this company would be to use a higher discount rate for future cash flows reflecting the risks inherent with the business model. Another approach would be to calculate a liquidation value (as demonstrated here for another company) to estimate what shareholders might expect if the company decides to liquidate. Or, you can do as Buffett suggests, and just not "swing" at the company and continue looking for better situations. Occasionally, we have guest authors contribute to this blog. The following post was written by Alex Garcia. Alex regularly writes for Contrarian Value Investing, and runs a portfolio which can be seen here. Shorting is a common technique on Wall Street as investors try to profit from both rises and falls of particular stocks. But one thing I never really understood is why short in the first place. Bill Ackman comes to mind as a successful short. I'm pretty sure there are other individuals who have successfully shorted stocks for a living and will continue to do so. If I short a stock, my biggest gain will be 100% and my biggest loss could be limitless (assuming I do not get a margin call). On the other hand, if I buy a stock, my gain could be infinity, while my downside is limited to losing my initial investment or 100%. Now that’s what I call controlling my risk/reward. On January 2007, David Dreman wrote an article for Forbes titled "Short The Exchanges", in which he considered the following stocks: Chicago Mercantile Exchange (NASDAQ: CME), Intercontinental Exchange (NYSE: ICE), and NYSE Euronext (NYSE: NYX). At the time of writing, CME traded at $530. The stock continued its unprecedented run up to $714. The stock is well off its highs, but an individual would have had to stomach a 35% increase in CME’s stock price. Alex Garcia is a guest author and regularly writes for Contrarian Investing, and runs a portfolio which can be seen here. Throughout the book thus far, the authors have repeatedly demonstrated (through example) various companies that the markets have under and over valued. The authors discuss the various types of mistakes that the market makes in the cases where its valuations are errant, namely: exaggeration, oversimplification, or neglect. Graham and Dodd offer a simple way to beat the market by taking advantage of cyclical price swings: purchase a diversified group of leading common stocks when P/E multiples are below 10, and sell them at 15. Psychologically, humans have a very difficult time implementing this in practice. For example, this strategy would have called for purchasing stocks during the downturn of 1921, and selling out in 1925, missing out completely on the incredible bull market of 1927-29. Furthermore, it would have called for purchasing again in 1931, at which point market values were to continue to contract by a large margin. While leading companies are only subject to undervaluation during times when the market is pessimistic, the authors suggest that at all times there will be several less prominent stocks selling at discounts. In fact, during times when market leaders are cheap, less prominent stocks will often sell for cheaper. At the same time, stocks which are less prominent may also attain valuations far higher than they otherwise would. In general, such stocks have valuations which are exaggerated in either direction. This phenomenon is demonstrated using several examples. The authors also discuss market exaggerations of the following events: dividend changes, stock splits, mergers, and break-ups. Although an increase in the cash dividend is favourable, in most cases the market is willing to pay such a higher premium for the stock that buyers no longer benefit from the increase in the dividend! Stock splits, on the other hand, result in share price increases despite giving the stockholder absolutely nothing he did not have before! The authors believe psychology plays a large role in these seemingly non-sensical market movements. The investor wants action, and he is willing to contribute to this action if there is any bullish sentiment whatsoever. On the negative side, Wall Street will often punish stocks far more than is warranted during litigation. Examples are offered where at worst the litigation would have caused damage to a company far less than the stock had been punished by the market. Finally, the discussion returns to one which took place in the chapters on fixed-income investments. There, it was discussed that if a company should enter receivership, the value of the bonds will often far well below the value of the company’s assets minus its liabilities. Therefore, companies in receivership are pointed out as another area where the market unjustly punishes issues, and thus offer the investor another avenue in which to find value. Eric Fox reports here that Charlotte Russe (NASDAQ: CHIC) has no debt. While it's true that this is what the balance sheet says, in reality almost 70% of this company's assets are financed by debt. How do I figure? We discussed the importance of considering the effect of operating leases here. In essence, rather than buying its locations, CHIC has financed them, by agreeing to non-cancelable operating leases on them. If instead CHIC had bought their locations and used debt to finance them, you wouldn't ignore the debt would you? Essentially, this is the same thing, with CHIC having "current ownership" of these locations in return for lease payments. The effect of debt going from 0% of capital (as reported by Fox) to 70% makes this company far more risky than it appears. Debt is always senior to equity, meaning its payment requirements have to be serviced completely before anything left over can trickle down to equity holders. If a company can't service its debt requirements (in this case, operating lease payments), these assets can be taken away, further eroding the company's ability to earn money. With a debt to capital of 70%, this means the company has a lot of debt to service, leaving it not a lot of room to maneuver should this downturn cause a shortfall in operating profits. Fox recommended the company in May at $18, but it has since fallen to $12. So far, the company has managed to stay profitable, but this company should be viewed as one with a lot of debt, or investors could be in for a nasty surprise. Investors can find information on a company's operating leases in the annual report. In this chapter, the author supports the idea of giving to charities. If you are going to do so he advises to understand how effective the charity is at achieving their mission and determine how efficient the charity is at ensuring the money ends up in the right places. He has started the Jarislowsky Foundation which endows Canadian University Chairs in areas he feels are important subjects. The Foundation's main goal is "excellence" as opposed to what he believes to be the Canadian trait of mediocrity. He believes the Foundation is financially efficient because there are 3 board members with no paid employees and often they get the Government and always the Universities to put money alongside the Foundation's money with the endowments. Jarislowsky concludes the book with some advice. First, even as small investors, you can do very well by acting as a disciplined long term investor. Look for long-term growth and top management. Lastly, he gives the advice to use life for the good. Be loyal to mentors, friends and family and stay true to your values. Act with and expect integrity from others. Make sure that you like what you see in the mirror! A reader in the gaming industry asked me about Shuffle Master Inc (NASDAQ: SHFL). For all I know, Shuffle Master may make the best gaming products in the industry, supplying casinos with electronic tables, automatic shufflers, chip sorters and other gaming products. But for various reasons, we wouldn't go near this stock for our portfolio. Firstly, this company only has $155 million in tangible assets, but it's financed with debt of $222 million! For a value investor, this screams of risk. If hard times should hit this company, it is in no position to meet its obligations, and this would obliterate the value of its shares. As discussed here, we like companies with low debt levels that can outlast their competition when times are bad. Further exacerbating this issue is the fact that $150 million of that debt is due within the next 12 months, while the company has only $93 million in current assets. That leaves them in a bit of a liquidity crunch. That's not to say that they won't be able to refinance, but considering the economic climate, the terms of such a refinance may not be that pretty for shareholders. But can this company earn its way out of this debt situation? It's possible, if this company can grow its revenue or cut its expenses. But such a scenario is not something we value investors would like to bet on. We're much more comfortable assuming management can generate the types of returns on capital that it has in the past. The company's return on assets for the last couple of years is below 5%. At those rates of return, I'm not too excited about letting management re-invest my earnings, but that's exactly what they'd do, as they pay no dividend and, considering their debt levels, they are in no position to be able to either! All in all, this company doesn't even make it to the valuation stage. Unfortunately, we're pretty discriminating in our choice of companies. For examples of the types of companies we do like, see here.